Jan Blachowicz is the reigning KSW Light Heavyweight champion with career victories over Houston Alexander, Goran Reljic, and Mario Miranda. Blachowicz nearly brought his talents stateside for the upstart World Series of Fighting promotion, but talks fell apart, and now Blachowicz is awaiting his next title challenger in Poland. Blachowicz began his MMA career in 2007, losing his first fight via decision to Marcin Krysztofiak. Despite the loss, Jan signed with Poland’s leading promoter, KSW. His first fight with KSW was no easy order as he entered a 8-man, 1-night tournament. Blachowicz proved himself in a big way, winning all 3 of his fights to win the Grand Prix. Just as Blachowicz’s career looked to be taking shape, he lost his next fight to journeyman Andre Fyeet. It would be the last time Blachowicz would taste defeat for nearly 4 years. Blachowicz rebounded by beating some of Europe’s top Light Heavyweights, Maro Perak, Christian M’Pumbu, and Antoni Chmielewski. Blachowicz looked to broaden his horizons by moving stateside with teammate and UFC veteran Tomasz Drwal. Jan began training at Team Alliance, but he he was unable to find any fights and unfortunately ended up suffering a knee injury that nearly wiped out 18 months of his career. Jan moved back to Poland and resumed his career with KSW. He entered KSW’s Light Heavyweight tournament where he won 2 fights in 1 night, setting up a finals matchup between him and Bellator veteran Daniel Tabera. Blachowicz claimed his 2nd tournament by finishing Tabera via 2nd round TKO. KSW brought in UFC and PRIDE veteran Rameau Thierry Sokoudjou to challenge Blachowicz for the vacant KSW Light Heavyweight championship. Sokoudjou was able to pull off the upset as he battered Jan with leg kicks, forcing the stoppage after 2 rounds. Jan would be sidelined for over a year due to injuries suffered in the Sokoudjou fight. Upon his return in 2011, he submitted Toni Valtonen to set up a chance at revenge against Sokoudjou. This time, Blachowicz controlled Sokoudjou for most of the bout, nearly finishing the fight in the 3rd round, before hanging on for a unanimous decision victory. Blachowicz has since defended his title twice, defeating Houston Alexander and Goran Reljic, while also picking up a non-title win over Mario Miranda. Blachowicz was rumored to have signed with WSOF and was set to face Anthony Johnson, but talks fell apart after Jan refused to sign a multi-fight contract. Jan has since announced that he is able and willing to defend his KSW title, but there has been no word on a new challenger. Blachowicz began training at Octagon Rynik, but eventually moved over to PRIDE veteran Pawel Nastula’s camp. Nastula’s team has some of the best Polish talent in the sport including recent UFC signee Daniel Omielanczuk. Blachowicz attempted to train stateside at Team Alliance alongside Tomasz Drwal, but he was unable to find fights in the US and eventually returned back to Poland. The UFC hasn’t made a full-pledged effort at bringing its promotion to Poland. They did just sign Polish fighters Piotr Hallman and Blachowicz’s training partner Omielanczuk, and will likely be on the lookout for more Polish talent as they are rumored to be visiting in 2014. Jan Blachowicz has been UFC ready for a couple of years now. He has gone 14-1 since 2008, with his only loss avenged. There is little left for Blachowicz to accomplish on the Polish regional scene, or anywhere outside of the UFC. It’s curious as to why the UFC was not willing to sign Blachowicz outright following his recently rumored talks with WSOF. 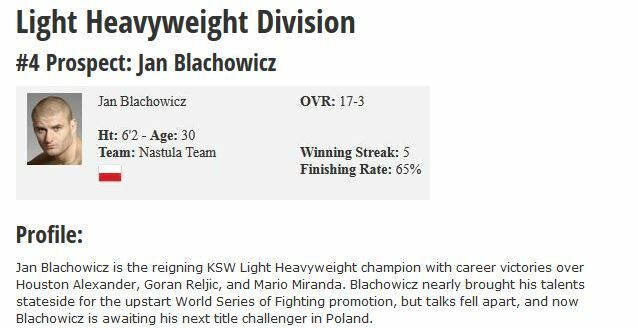 With the UFC likely heading to Poland in 2014, Blachowicz should have been one of their top 3 targets in the Polish MMA market. Blachowicz has solid striking, complete with power and a long jab. He is not the quickest fighter in the world, but he is accurate and usually makes his punches and kicks count. He has struggled with his striking defense at times, especially when it comes to leg kicks, but he has usually been able to counter those kicks with well-timed takedowns. Blachowicz was once considered to be a better striker than grappler, but now those skills are nearly even. Blachowicz is a very skilled grappler for his size. His submission defense and transitions are above average and he has proved capable of attacking with his own submission game. Blachowicz’s wrestling is the one big question mark at this point in time. He has answered the challenge thus far against the likes of Mario Miranda and Daniel Tabera, but they are hardly considered elite grapplers. Blachowicz’s lack of elite athleticism could come back to haunt him in the UFC. He tried valiantly to train stateside alongside guys like Phil Davis and Dominick Cruz, but it ultimately did not work out. Now, he trains with lesser skilled wrestlers in Poland that are likely unable to give Blachowicz the training he needs. 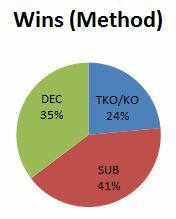 Nonetheless, Blachowicz has the technical skills and overall polish to go into the UFC and win immediately. He should be able to hold his own against the bottom half of the UFC’s roster, but could conceivably struggle against most of the Top 20. Blachowicz was fully ready to test his skills against Anthony Johnson, and likely had the grappling to possibly give Johnson trouble. Now, Blachowicz will have to wait for the UFC’s possible arrival to Poland where he could be an immediate signing for the hometown fans. Should Blachowicz sign, he has the potential to become the most accomplished Polish fighter to ever fight in the UFC.